Now, just in time for Valentine’s Day, Salvatore Ferragamo is offering 70 lucky gentlemen a unique opportunity to show their love with a precious limited edition of the popular Ferragamo Grande Maison. Strictly limited to 70 pieces worldwide, the 33 mm Grande Maison Valentine’s Day Special pairs an evocative Gancino-shaped IP gold case with 12 brilliant diamonds on the bezel and an elegant silver dial with guilloché finishing. The lustrous IP gold case is water resistant to 100 feet. 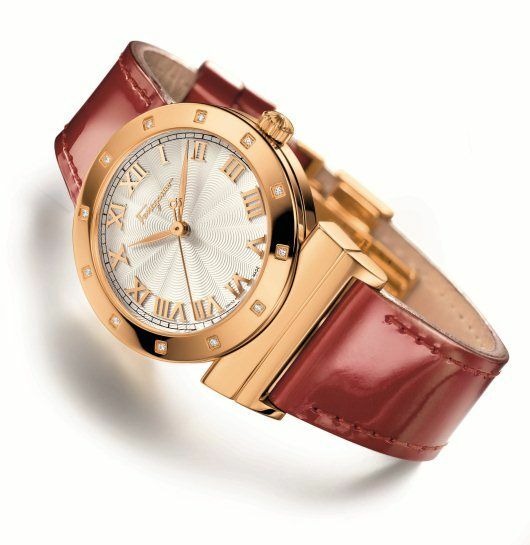 The Grande Maison Valentine’s Day Special is powered by a precision Swiss made Ronda 763 quartz movement and has been equipped with a fabulous soft red leather strap. This richly colored strap provides the perfect complement to the lustrous IP rose gold case. Not only is red the color of love, it is also the emblematic color of Ferragamo. This is truly an iconic timepiece designed to be worn by sophisticated women as the symbol of a union that stands the test of time.